wildfire recovery projects Happening now - We need you! 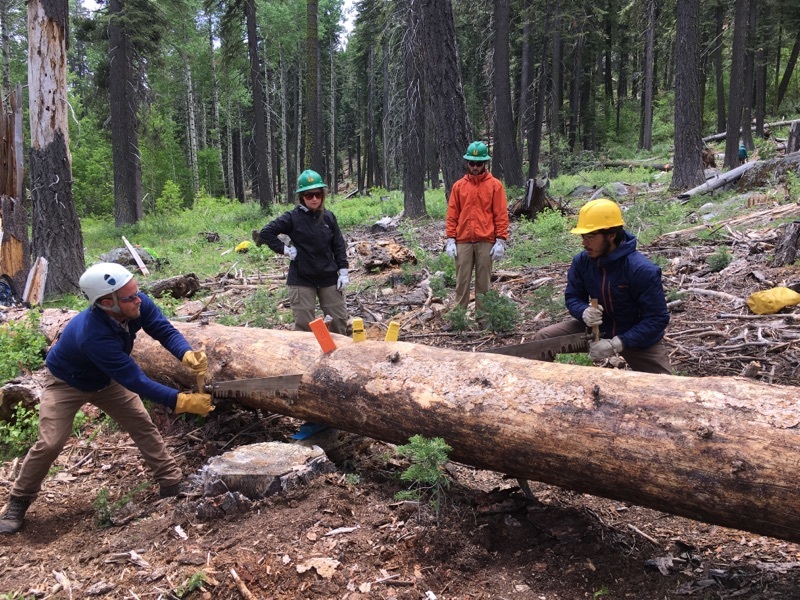 WildPlaces has partnered with the Western Divide and Hume Lake Ranger districts - Sequoia National Forest, Back Country Horsemen of America, and Sequoia Roots Restoration Corp in planning numerous tree planting and trail repair projects utilizing community-based planting crews and volunteers. Events are underway and more volunteers are needed to complete these difficult and important habitat restoration projects. "In days of increased human-caused climate change, two things are certain: Widfires (different from natural fires) are not going away and neither is WildPlaces' Wildfire Recovery Projects," says M. McMillan Founder of WildPlaces. Sequoia Roots Restoration Corp will bottomline the trail and tree planting activites for WildPlaces. Through generous support from National Forest Foundation, Rose Foundation, and Fund for Rural Equity, two tree plantings have been scheduled for summer 2017 and 2018 (See calendar). Volunteers are needed to plant 3,000 seedlings in the Cedar Wildfire Burn Area located near Portuguese Pass and Sugarloaf, which, in 2016 burned 30,000 acres in the Sequoia National Forest. Additionally, 2.5 miles of trail within the Rough Fire Burn Area within the Monarch Wilderness has been virtually destroyed by wildfire (Yes, wildfires can destroy trails and roads along with forests and property). Public understanding and active participation in these processes is fundamental for land managers to more successfully restore critical habitat on public lands. This project has created the Sequoia Roots Restoration Corp, a trained crew of paid young men and women who implement the on-the-ground conservation, stewardship and restoration work that WildPlaces does. With unemployment amongst young people in the southern San Joaquin Valley at over 20%, jobs are of paramount concern, without which youth will continue to drop out of school, join gangs, be incarcerated, and fall to the limitations of teen pregnancy. All of these metrics of poverty exist in the regions from which WildPlaces will recruit both volunteers and paid members of the Sequoia Roots Corp.
More jobs in the environmental sector is one important tactic used by WildPlaces to ensure that respect, reverance and resources are invested in caring for the land. Positions may be open for the Corp, so check in with WildPlaces at info@wildplaces.net and 559.539.5263. While natural processes play a major role in forest fire recovery, certain actions to protect California watersheds can be taken to speed the recovery of resource and recreation values by reducing sediment and soil erosion, re-establishing native plant species and seed trees, and repair recreation trails. Planting seedlings that will one day become the seed source for the whole forest and restoring access for recreation and future emergencies are the goals we will undertake. The Sequoia National Forest Wildfire Recovery Project will have significant impact in reaching these goals, and WildPlaces has the experience, partnerships, and commitment to ensure the project reaches its fullest potential. Since 2001, WildPlaces has implemented dozens of public and private land projects, enjoyed the participation of thousands of volunteers, and experienced a 100% safety record. WP has also enjoyed 9 years of partnership with National Forest Foundation with continuing support this year from two of NFF's programs: the Community Capacity and the Land Stewardship Programs, which will reciprocally enhance this proposal. Support of this proposal will result in more restored habitat, more ecosystem-based jobs created through the proposed Sequoia Roots Corp. According to SNF resource managers and the Rough PostFire BAER, suppression cuts and trail repair is the first phase of recovery efforts and is needed to return the affected area to pre-fire conditions. Controlling erosion and run-off from fire suppression containment lines and damaged recreation trails are high priorities for the Forest Service to ensure healthy watersheds. Trail recovery is not beginners work. These Sequoia Roots Restoration Corp members must complete Wilderness Ranger Academy and pass the Crosscut Saw Certification. All of our corp members and volunteers have done so. Congrats Miguel Pena, Josh Moore, Daniel Mejia, Pedro Garcia and Liz Rivera. For all events, we will meet at Comisión Honorífica Mexicana Americana (CHMA) which is located at the following address: 466 East Putnam Ave Porterville, CA 93257 at 8.30 a.m. for a 9 a.m. departure on Saturday May 13th and June 3rd. Transportation is available for those planning to camp over night. Travel time is an hour from Porterville and requires caravanning with WildPlaces unless participants have a very good understanding of the area. The work will entail planting five species of coniferous, bareroot-seedlings to restore destroyed "seed trees" which are critical for forest recovery . . . no seeds = no forest. The terrain and work are moderate to difficult and require proper Personal Protection Equipment (PPE), clothing, gear, good physical fitness, and basic camping skills. Planting experience is not required. WildPlaces can provide gear if needed. We will car camp on a primitive site (no water, no bathrooms) for tree plantings at the Cedar Fire and within the Wilderness for trail work on Rough Wildfire. Participants must stay together as directions and locations can be difficult to follow.